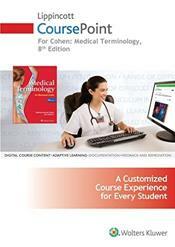 Lippincott CoursePoint for Medical Terminology is an integrated digital curriculum solution for allied health and nursing education. CoursePoint provides a completely integrated and adaptive experience, all geared to help students understand, retain, and apply their course knowledge and be prepared for future courses and beyond. CoursePoint is structured in the way that students study, providing them the content exactly where and when they need it for a more effective learning experience. The powerful integration of adaptive learning, powered by prepU, with the premium digital course content provides a personalized learning experience that drives students to immediate remediation in their course content and allowing instructors and students assess their progress in real-time. The digital textbook is downloadable, so students will have perpetual access to this content.